The following text comes from our high school book, Lands of Hope and Promise: A History of North America. To read earlier excerpts from our account of the Cristeros, please go here and here. To see sample chapters of this book, go here. For ordering information on Lands of Hope and Promise and our other texts, please click here. The Cristero rebellion would have died in the summer of 1927 but for one man — the guerrilla leader, Victoriano Ramirez. El Catorce (“the Fourteen”) men called him for a legendary feat — that after breaking out of jail, he single-handedly killed 14 members of a posse sent out to arrest him. 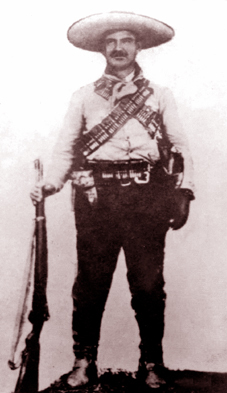 With the fame of this legend and a keen grasp of guerrilla tactics, Ramirez rekindled the rebellion in the Los Altos region of Jalisco There he found ready followers; for, not only had Los Altos all along been been the center of the rebellion, but its people had suffered harsh repression by the government. Federal troops had forced the native population to leave their homes and go into concentration camps. In this way the government thought it could keep the peasants from supplying the Cristeros and, moreover, confiscate their food and livestock. With the rebellion again in full swing, the Liga Defensora decided that the scattered Cristero forces needed coordination and military discipline. They turned thus to a retired general, Enrique Gorostieta y Velarde, to take on overall command of the rebellion. Gorostieta, however, did not embrace the aims of the Cristeros. The mercenary general (he demanded twice the salary a federal general would receive) was a Liberal and a Freemason and mocked the religion for which the Cristeros died. But Gorostieta opposed Calles. His dream, it seems was to establish a truly Liberal republic that enforced separation of Church and state but did not interfere with religious belief or practice. Believer or not, Gorostieta was an able commander. He turned the ragged bands of Cristeros into a disciplined army. The rebellion that had seemed dead now took on new life. Cristero forces grew to between 40,000 and 50,000 men and throughout 1928 defeated federal forces time and again on the field of battle — and this, despite the fact that the United States was supplying the federals with arms. President Calles thus had no choice but to see the Cristeros for what they were: a serious challenge to his government…. Last week, we told the story of one of Napoleon’s first great victories, the Battle of Marengo — a victory that ended almost in defeat. This week we tell of his last battle, Waterloo, where he went down in definitive defeat. This text comes from our book, Light to the Nations II: The Making of the Modern World. See sample chapters, here. For ordering information on Light to the Nations II and our other texts, please click here. Following his return to the imperial throne, Napoleon failed to make peace with the allies. He had offered to respect the boundaries of France drawn up by the Congress of Vienna if it would recognize his government; but the allies ignored him and resolved on war. Perhaps Napoleon’s greatest sorrow, however, was the Austrian court’s refusal to return his son to him. And very bitter too was the news that Empress Maria Louisa had sworn never to see Napoleon again. While the cardinals wrangled over who would be the next pope, Napoleon Bonaparte turned his tireless energy to bring lasting peace to France. This was a daunting task, for France again faced war from without, and rebellion from within. Angry over the Directory’s persecution of religion, the Vendée had again risen in rebellion; meanwhile, the allied powers were threatening to invade France to place Louis XVIII on the throne he claimed was his own. How did Napoleon meet these challenges and threats? As for the Vendée, he showed tolerance. He promised the Vendeans complete freedom of religion and, in February 1800, they laid down their arms. To the allies, however, he would not be so gentle. With them, he would meet force with force. In the Paris salon of the Duchess of Maine, François-Marie Arouet began the literary career that would make him the most famous philosophe in Europe. The year was 1715, and Arouet had just returned to Paris from The Hague in the Netherlands. Arouet had mixed with aristocratic freethinkers before going to The Hague; for though he belonged to the middle class, his mother had friends among the nobility. The duchess of Maine’s salon was a distinguished one, but also quite dangerous for a young man like Arouet. The Duchess was a bitter enemy of the Duke of Orléans (the regent of King Louis XV, who in 1715 was still only a boy). Under the duchess’s influence, Arouet wrote poems mocking the regent—a dangerous thing to do, as Arouet soon learned. Because of his lampoons, Arouet was forced to leave Paris in May 1716. Shortly afterward, he was allowed to return; but in 1717 he was arrested and sent to the Bastille. Some anonymous lampoons had surfaced, and the government thought Arouet had written them.